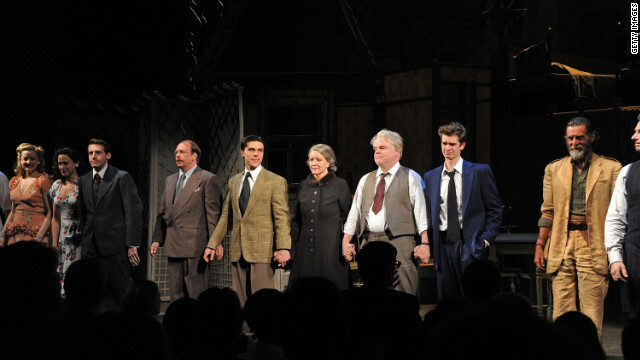 Cast members of "Death of a Salesman" take a curtain call at their Broadway opening on March 15 in New York City. Editor's note: Julian Zelizer is a professor of history and public affairs at Princeton University. He is the author of "Jimmy Carter" (Times Books) and of the new book "Governing America" (Princeton University Press). Princeton, New Jersey (CNN) - Seen from the perspective of 2012, the stunning Broadway revival of "Death of a Salesman" offers a powerful reminder that economic policy and family values go hand-in-hand. Although many current politicians like to separate these two issues, the economic foundation of the family is central to its long-term health. In this classic play by Arthur Miller, premiered in 1949 to mesmerized audiences that had lived through the Great Depression, the protagonist is salesman Willy Loman, who is mentally broken down from his constant travel and struggle to make ends meet. "A small man can be just as exhausted as a great man," says Loman's wife, Linda. Loman's son Biff is unable to find a job and fulfill his father's hopes. Biff and his brother, Happy, are worried about their father's mental health, which is rapidly deteriorating. When Willy tries to find a job where he can stay in town to take better care of himself and his family, he ends up losing his job. The story disintegrates from there, culminating with Willy tragically committing suicide with the hope that Biff will use the life insurance money to start his own business. Too often, politicians ignore the kinds of strains that economic problems cause for families.